Marking is an occupational hazard for all teachers. 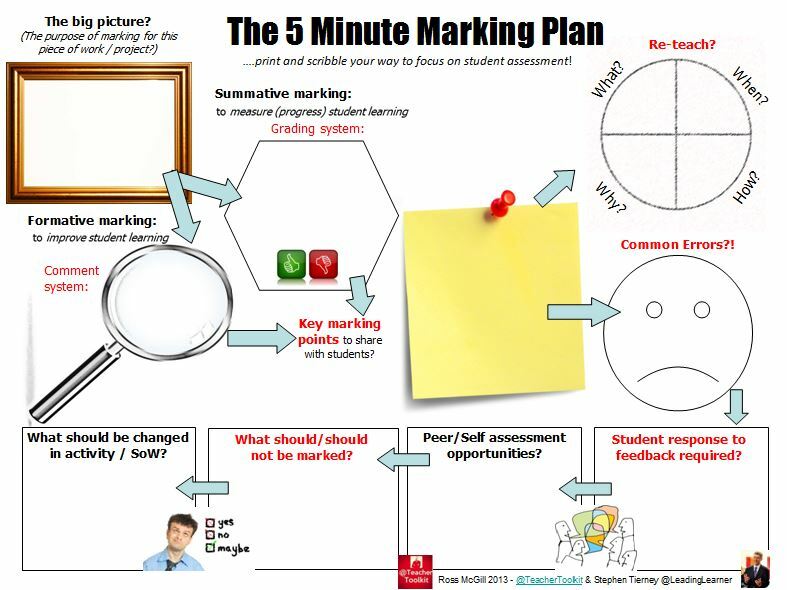 Whilst the “5 Minute Marking Plan” can’t do your marking for you (sadly) it will help you focus on the job in hand and help ensure you maximise your students’ learning and your own. 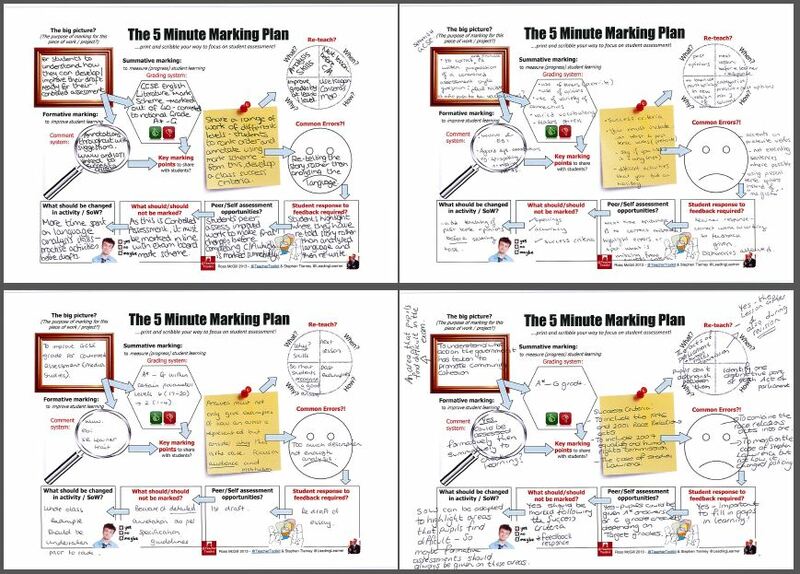 This planner adds to a growing number of 5 Minute Plans produced by @TeacherToolkit including the “5 Minute Lesson Plan” and the “5 Minute Assembly Plan” which are available on @TeacherToolkit’s website. The big picture? What is the purpose of marking for this piece of work / project? Try to be clear right from the beginning how the time you spend marking will improve teaching & learning. Summative marking – Grading system: Are you going to use GCSE or A-level grades? Is it levels or have you started to think about a post-levelling world? Is it a numerical mark out of 10 or 20? Does the school, department or phase have an agreed system for teachers to use? Formative Marking – Comment System: Do you have an agreed way of giving comments on students work – www (what went well), ebi (even better if), ioti (in order to improve), three stars and a wish? Have you given thought to numbering / lettering the key marking points, shared with students, so teachers can give comments via numbers / letters instead of writing out comments in full? Will you annotate the piece of work by putting the numbers / letters against the corresponding questions / text? Key marking points to share with students? This is absolute critical. 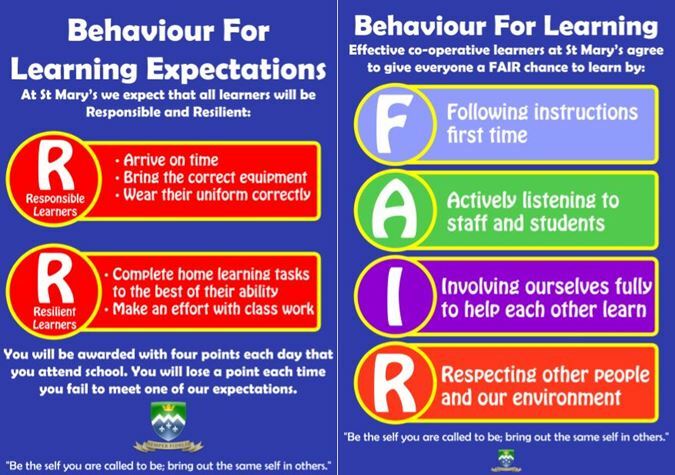 First of all teachers and then learners need to be clear what marks can be gained for. It’s all about teacher clarity. Sharing the key marking students with learners before they start the work will really help improve their work. Don’t forget to include a bit of “spoof assessment” to help learners understand what the key marking points are. You can give learners two answers of different quality and get them to assess them using the key marking points – can they grade / level the work and give reasons why. Another approach is to give them the different pieces of work and get learners to rank them and identify the main reasons why one was better than the other – can they give you the key marking points? 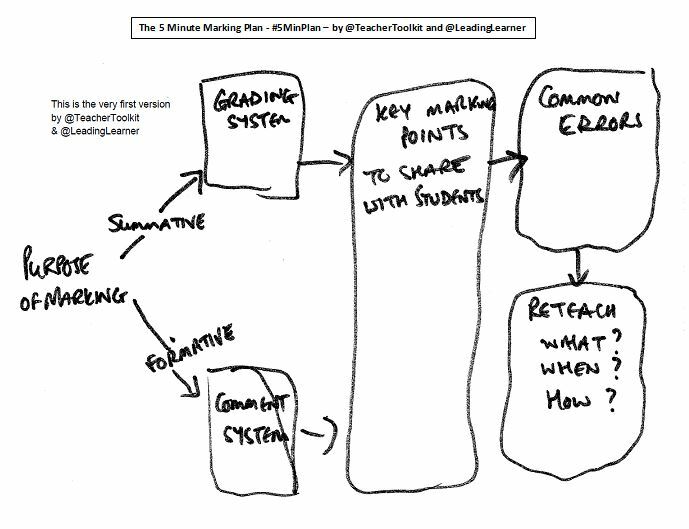 Common Errors – identifying common errors across a number of learners’ work is an important part of diagnostic assessment and links to other parts of the #5 Minute Marking Plan – Re-teach, Student Response to Feedback and What Should be Changed in Activity / SoW . Re-teach – is there an important part of the module, topic, lesson that learners just haven’t got. Don’t worry it happens to all teachers. 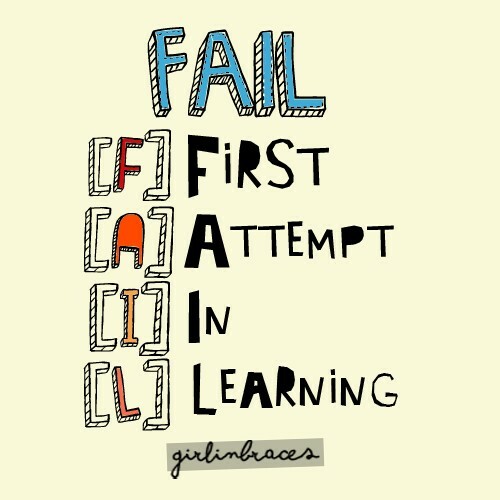 The important thing is to spot the “gap” in learning and then go back and address it again. 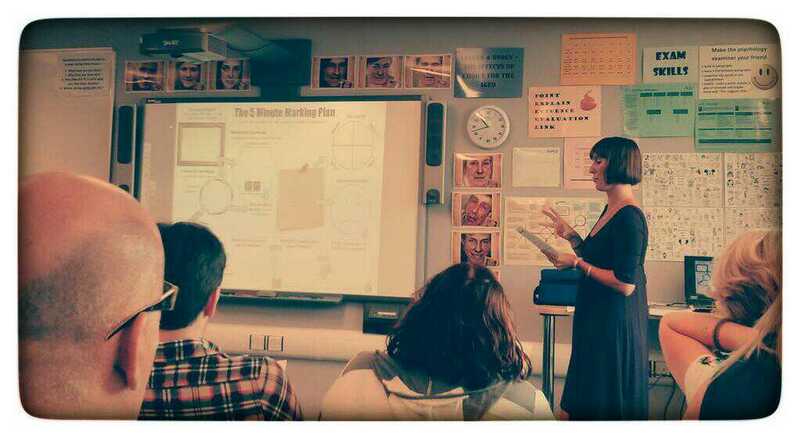 Plan the re-teach: What, When, How & Why? Student Response to Feedback Required? – Once you’ve spent time putting comments on learners’ work they must go back and either correct errors or redo areas of their work that needs improvement. A good strategy is to give students time to correct / redo the work during the lesson when the work is handed back – this is a key part of them improving and learning. Think about it, every student has a personalised action plan of ebi / ioti / a wish (or two) to work on. 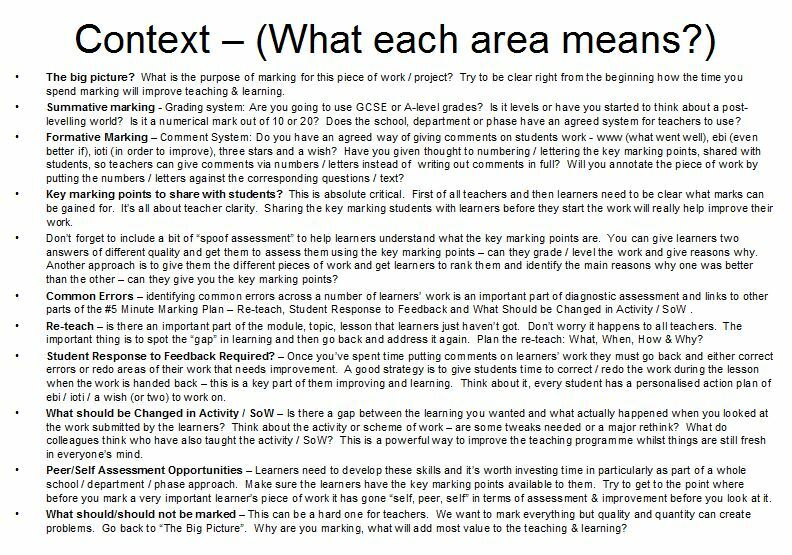 What should be Changed in Activity / SoW – Is there a gap between the learning you wanted and what actually happened when you looked at the work submitted by the learners? Think about the activity or scheme of work – are some tweaks needed or a major rethink? What do colleagues think who have also taught the activity / SoW? This is a powerful way to improve the teaching programme whilst things are still fresh in everyone’s mind. Peer/Self Assessment Opportunities – Learners need to develop these skills and it’s worth investing time in particularly as part of a whole school / department / phase approach. Make sure the learners have the key marking points available to them. Try to get to the point where before you mark a very important learner’s piece of work it has gone “self, peer, self” in terms of assessment & improvement before you look at it. What should/should not be marked – This can be a hard one for teachers. 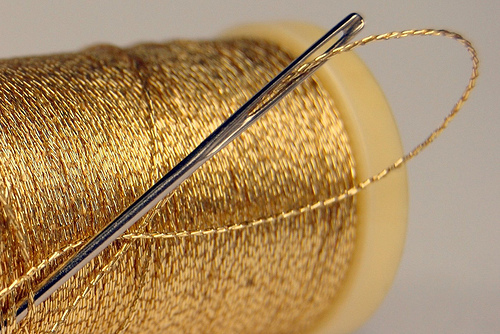 We want to mark everything but quality and quantity can create problems. Go back to “The Big Picture”. 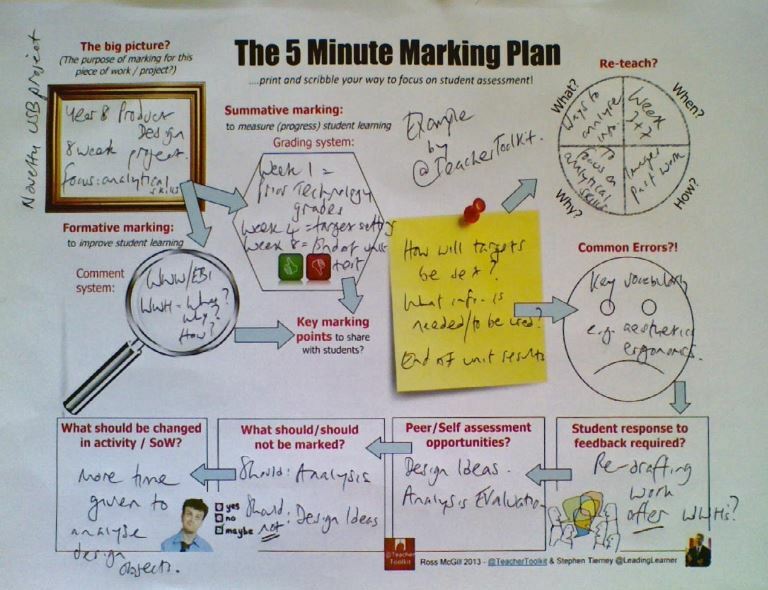 Why are you marking, what will add most value to the teaching & learning? Remember, there is no need to complete every box they are there as a guide for you to use. 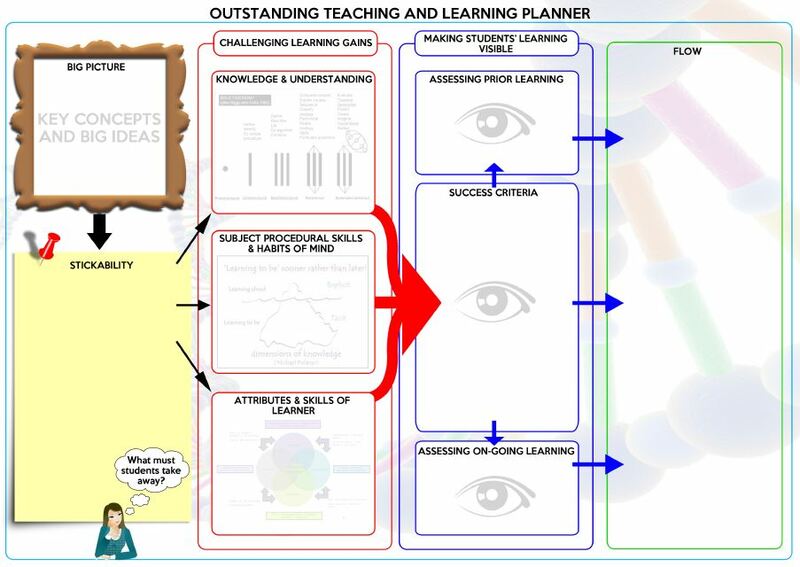 With special thanks to the staff at Grieg City Academy who tested an early draft of the plan and to Sam, Cathy, Jenna and Clair who produced a set of Key Stage 4 exemplars (PDF Resource) in just over five minutes, which is great going for the first attempt at using the plan, at very short notice. 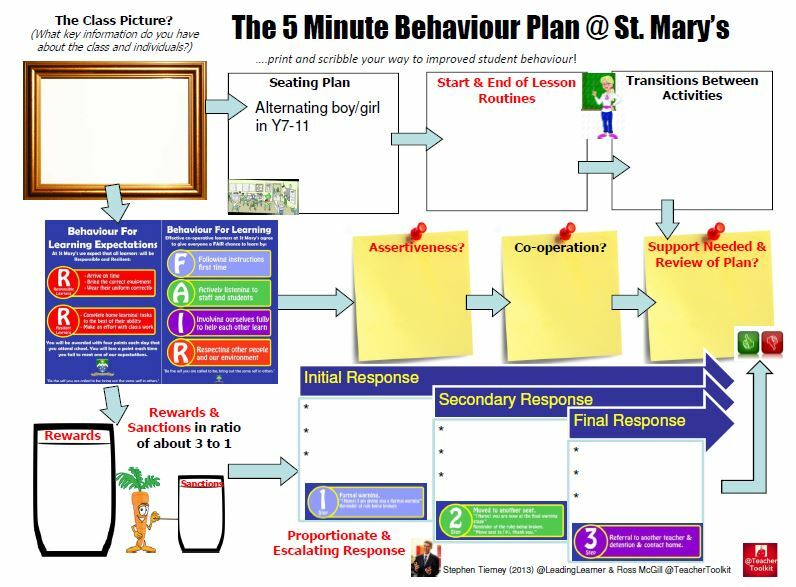 With a bit of practice the plan becomes more familiar and easier to use – we may need to rename it the “Sub 5 Minute Marking Plan” before too soon. The last few weeks has been my first major “collaboration in the ether” with @Teacher Toolkit and this has been central to producing the marking plan. I hope it won’t be the last as genuine collaboration can not only be great fun but benefits both parties. If you ever want to show the power of collaboration here is the first draft that @TeacherToolkit and @LeadingLearner managed to produce. What an evolution! The College’s Marking Policy is here and contains a bit of “pull, push and nudge” to try to ensure quality marking & feedback is given to all students.